Picture frames are all-occasion gifts, of course, but people eventually get tired of receiving them if they are too conventional, ordinary, and boring. The Indian chicken picture frame jazzes up the gift idea by combining a picture frame with a stuffed toy. It will be such a hit among children, and will also be perfect as a giveaway during parties and baby showers, as well as a prize or promotional item. The materials will cost P655, from which you may be able to produce about 8 to 9 Indian chicken picture frames. Depending on your target market, you can sell this Indian chicken picture frame for P50 to P100 apiece. You can buy the materials at textile stores in Divisoria, Manila, or in your city, and the tools from any bookstore or craftstore. Step 1. You can enlarge the patterns printed here onto an A4 bond paper size or download them from www.businessmaker-academy.com. Step 2. Cut the patterns and trace them onto the cloth. Use the yellow nylex cloth for the chicken body and the red hard felt for the tail, crown or comb, wings, beak, and frame. Cut the cloth following the patterns. 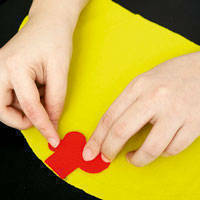 When cutting the cloth for the body parts, leave an allowance of a half inch, to an inch from the edge. You should have seven pieces for the chicken – body, comb, tail, wings, beak, and the frame – and around 12 pieces for the Indian hat. Use the orange hard felt for the hat; the red, dark blue and light blue hard felt for the feathers of the Indian hat; and the dark blue for the accents. The diamond-, moon-, and flower-shaped patterns are used as accents on the hat. For the Indian hat, you should make four pieces of pattern C, six pieces of pattern D, and several pieces of the diamond, moon-, and flower-shaped patterns. Step 3. 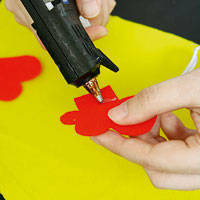 Once you’ve readied the cloth, heat the glue gun. 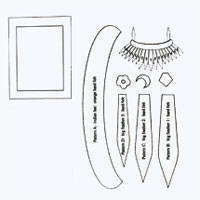 Get the pieces corresponding to the body and the comb. Fold the body in half and mark the fold. Step 4. 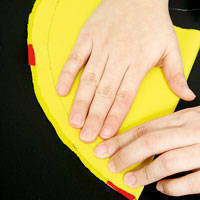 Put the comb in between the fold; the largest lobe portion should face the fold. 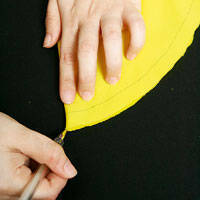 Now get the tail and place it opposite to the vertex or tip of the folded cloth. Then glue the comb and the tail to the body. Once you have attached the two pieces together, glue the edge of the body. Put glue on the trace or mark, then fold the cloth and press. Make sure that there is no hole and that the edge is glued well.